Motorcycle enthusiasts, have you been looking for the future in helmet technology? Skully thinks they have it with their freshly unveiled AR-1 Android-powered helmet that just went live on Indiegogo this morning. The helmet, which has already been given praise by outlets such as Popular Mechanics, Road & Track, Popular Science, and celebrity chef Tyler Florence (wait, what?) blew past its funding goal of $250,000 moments after it went live. 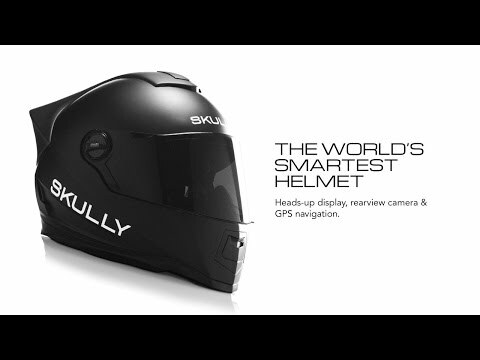 The helmet is powered by Android behind-the-scenes, includes a heads-up display that can show you information as you ride (like turn-by-turn navigation), an ultra-wide angle rear camera, and connects wirelessly to your phone. Thanks to Bluetooth, you can listen to music through your phone and even place hands-free calls. On a motorcycle front, the helmet is DOT/ECE certified, has a fog, scratch, and glare resistant visor, interchangeable padding inserts, and should be light enough for all riders. The AR-1 starts at $1399 and comes in either matte black or gloss white. If you want a signed or international version, the price goes up from there. As I already mentioned, the campaign to make this project a reality has already blown past its funding goal of $250,000. As I write this post, the AR-1 stands at just over $591,000, which is up over $20,000 from when I first started writing this. I think it’s safe to say that this should become a success, assuming Skully can get the product out the door in a timely manner.